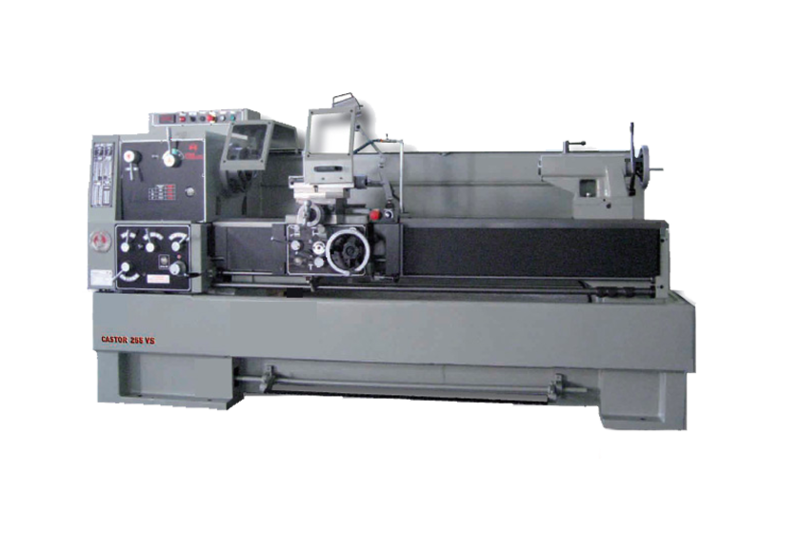 A parallel metal lathe or metalworking lathe is a large class of lathes designed for precisely machining relatively hard materials. They were originally designed to machine metals. Turning is a machining process in which a cutting tool, typically a non-rotary tool bit, describes a helical toolpath by moving more or less linearly while the workpiece rotates. The tool’s axes of movement may be literally a straight line, or they may be along some set of curves or angles, but they are essentially linear (in the nonmathematical sense). This operation is one of the most basic machining processes. That is, the part is rotated while a single point cutting tool is moved parallel to the axis of rotation. When a workpiece is fixed between the headstock and the tail-stock, it is said to be “between centers”. When a workpiece is supported at both ends, it is more stable, and more force may be applied to the workpiece, via tools, at a right angle to the axis of rotation, without fear that the workpiece may break loose. When a workpiece is fixed only to the spindle at the headstock end, the work is said to be “face work”. When a workpiece is supported in this manner, less force may be applied to the workpiece, via tools, at a right angle to the axis of rotation, lest the workpiece rip free. Thus, most work must be done axially, towards the headstock, or at right angles, but gently. When a workpiece is mounted with a certain axis of rotation, worked, then remounted with a new axis of rotation, this is referred to as “eccentric turning” or “multi-axis turning”. The result is that various cross sections of the workpiece are rotationally symmetric, but the workpiece as a whole is not rotationally symmetric. This technique is used for camshafts, various types of chair legs. The tool-post is operated by lead-screws that can accurately position the tool in a variety of planes. The tool-post may be driven manually or automatically to produce the roughing and finishing cuts required to turn the workpiece to the desired shape and dimensions, or for cutting threads, worm gears, etc. The turret lathe is a form of metalworking lathe that is used for repetitive production of duplicate parts, which by the nature of their cutting process are usually interchangeable. It evolved from earlier lathes with the addition of the turret, which is an indexable toolholder that allows multiple cutting operations to be performed as knurling. Cylindrical holes can be created by the use of twist drill bits on the spindle. Since normal drill bits could bend during machining, it is necessary the short drill bits track the surface of the workpiece by cutting and engraving it. It is possible then to drill with cross-cutting tools.